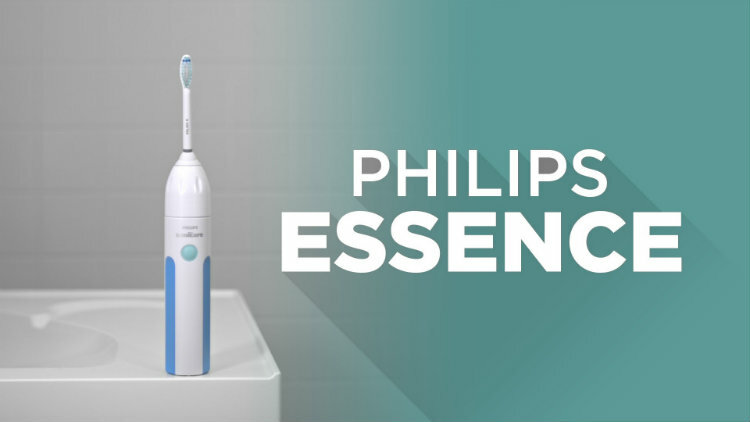 The Essence is Philips most basic electric toothbrush available on the market. It has 31,000 brush head movements per minute, and it can brush your teeth just as good as the 3 and 4 times more expensive models out there. When you are looking for an electric toothbrush that can serve you in preventing plaque, gum disease and gingivitis, there are a lot of different options out there. Philips has been a long-standing favorite brand for many people. This has been mostly due to the many different electric toothbrush models that they offer, as well as their strong marketing campaigns. 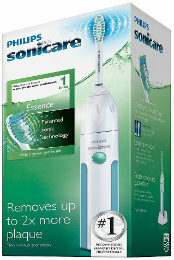 In recent years, Philips has come out with the Sonicare line of electric toothbrushes. One of their first offerings was the Phillips Sonicare Essence. This is a rechargeable electric toothbrush that is one of their more popular products. To learn a little bit more about this toothbrush, what it does and whether it is worth it, we’ll dive into some points below. Consider these tips below to learn a little more about this brush in order to decide whether it is worth your purchase or not. This electric toothbrush is designed in a way that is intended to give people comfort whenever they use it. It is thick enough to get a firm grip, with a swiveling head that allows you to access the nooks and crannies of your teeth and gums. The design itself is sophisticated, if not straightforward. It comes in a white color and features light blue trim along the sides. It is pretty easy to operate, due to the fact that the power button and charging mechanism is conspicuous in the middle and gives you the opportunity to access it whenever you would like. The brush is pretty easy to grip and comes with a charging station. In terms of design, there are more exciting toothbrushes out there on the market. If aesthetics are a serious deal breaker for you, this may not be the brush you are looking for. You might want to refer to our list of best products and check out some of the higher priced models. However, if a functionality is your main concern, you will be able to feel good about this purchase. One of the greatest benefits of this product is that it is easily up-gradable once your brush head is worn out. 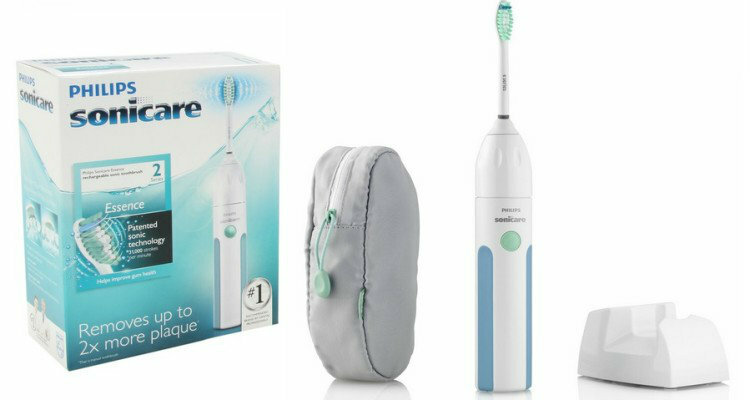 The Essence model comes out of the box with brush heads that will remove plaque and double the rate of a manual toothbrush. 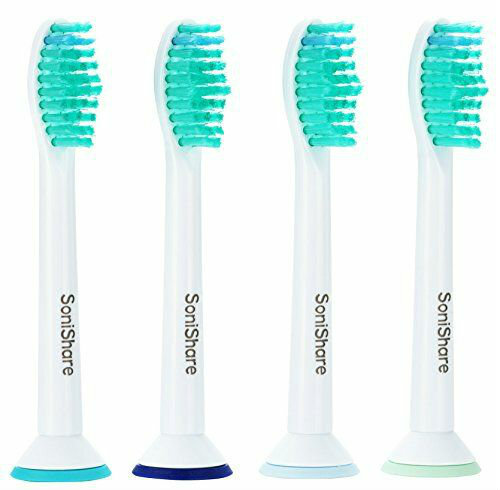 It is equipped with the standard E series toothbrush head, along with the ability to upgrade whenever you need it to. As with all lower Sonicare models, Philips has only included one brush head. This is rather annoying on their behalf, but they do it regardless. Another great bonus feature is that you will know when it is time to change the head due to the fact that the bristles will begin to fade away. This is a mechanism that was put in place so that you do not end up using any particular toothbrush head for a prolonged amount of time. If you brush twice a day, it is recommended that you change the brush head every 3 months or so. Much like with a manual toothbrush. One of the knocks against this particular toothbrush is that it does not come with a travel case. It also does not come with a travel charger. Instead, it has a stationary charger base that you attach the toothbrush to whenever you would like to give it some juice. While this is certainly more than enough to get the job done, there are better travel cases and travel chargers on the market. It can be a bit cumbersome making sure that you are clicking the toothbrush inside of the clip and attaching it to the charger base to make sure it is getting all the power that it needs. I would have much rather preferred that this toothbrush comes with an easy to use carrying case, along with a travel charger that you can plug up whenever you need to recharge. But, then, of course, we would be looking at a different price. One of the strong suits of this toothbrush is that the battery lasts for a long period of time. People who have left reviews for this state that they enjoy the fact that they will always be able to get a lot of brushes out of this toothbrush before it is time to recharge it. The battery life is definitely a strong suit, though you will notice when it is time to charge because the device will begin brushing with less intensity over time. Philips are known for producing rechargeable toothbrushes with strong battery life because they use Lithium-Ion batteries. In comparison, most of their competitors are still stuck using NiMH batteries, for some odd reason. You will be able to then plug the toothbrush back up into the base to make sure that you are giving yourself the power that is needed to keep it running on a regular basis. However, you do not need to worry about it dying out on you prematurely. You will be open to using the toothbrush for two weeks at a time on a single charge. Philips feels so strongly about its battery life that they also have included a two-year warranty. This is in addition to a money back guarantee for three months if you are not satisfied with the battery life and any other features. This toothbrush comes with an easy start mechanism and a smart timer that makes brushing so much easier and straightforward. Comfort is king, as his brush has a soft grip handle and beautifully designed bristles. The battery life allows you to get two weeks worth of uses before needing to even recharge. Due to sonic technology, your teeth will be brushed with gentleness, though it has the power of 31,000 strokes per minute. The true test of any toothbrush is trying it out for yourself. After trying out this particular model, I can easily say that it is worth the money. It is very easy to use and comfortable, thanks to the grip technology and the durability and stability of the brush head. It features a lightweight build of less than a pound and comes equipped with a high-quality lithium-ion battery. I had no problems and complaints and noticed that the toothbrush was able to get into the hard-to-reach spots that other toothbrushes simply were not able to. The price is right also, as this toothbrush typically retails for less than $30. READ MORE: If you do not feel like this is the right product for you, check out our best seller in this category.